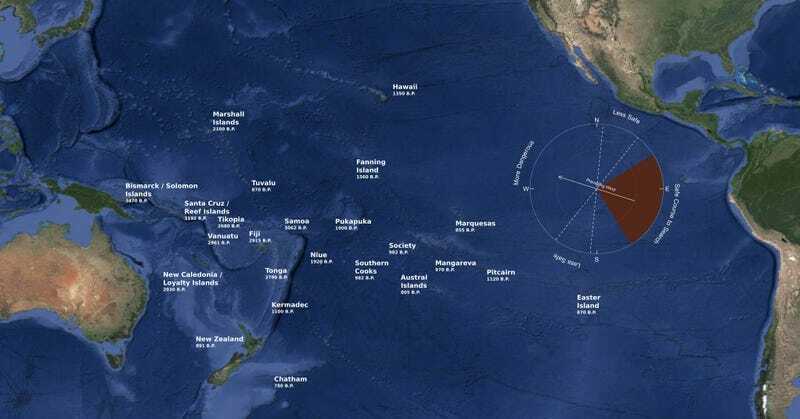 The 24 major island groups of the Pacific Ocean were settled by early Austronesians between 3,500 and 900 years ago, but little is known about how these isolated islands were colonized. Now, researchers have used epidemiological modeling to devise some compelling new ideas about how it was done. By adapting a model of how diseases spread among animals and humans, researchers led by University of Utah anthropologist Adrian Bell were able to create a simulation of ocean migrants “infecting” uninhabited islands. The researchers keyed in a wide number of variables, including pre-existing archaeological evidence of settlements, inferred levels of social hierarchy, island size, distances between islands, and prevailing wind directions. This resulting simulation provided Bell and his colleagues with a hypothetical timeline of Oceania colonization. The researchers draw several interesting conclusions from this timeline, in the latest issue of the journal American Antiquity. First, the Lapita people didn’t expand outward like ripples in a pond; rather, their advance was dictated by an island’s visibility, i.e. its height, width, and distance. Thus, volcanic islands, with their large “angle of target,” were likely spotted and settled first. We show how decades of thinking on colonization strategies can be brought together and assessed in one statistical framework, providing us with greater interpretive power to understand a fundamental feature of our past. On a related note, this technique could conceivably used to estimate how extraterrestrial intelligences might colonize the galaxy; instead of islands, astrobiologists could chart how colonization waves move between stars. Interestingly, one of the key findings of the Bell paper is that distance didn’t matter in the founding of early Pacific societies. Maybe a similar inference can be made for interstellar explorers.